Go against the grain with quinoa, the tiny seed that packs a big nutritional punch. Beloved by vegans, vegetarians, and bodybuilders alike, quinoa is easy to add to almost any recipe. This couscous-shaped seed of goodness is one of the only grains and seeds that contain the nine essential amino acids that the human body can't produce on its own. Plus, they're loaded with fiber, iron, magnesium, and manganese. Most people cook quinoa (pronounced KEEN-wa) like rice, but there are so many unique ways to incorporate this super-seed into your diet. Here are five of our favorite healthy recipes. This colorful dish would make a great side or lunch on its own. 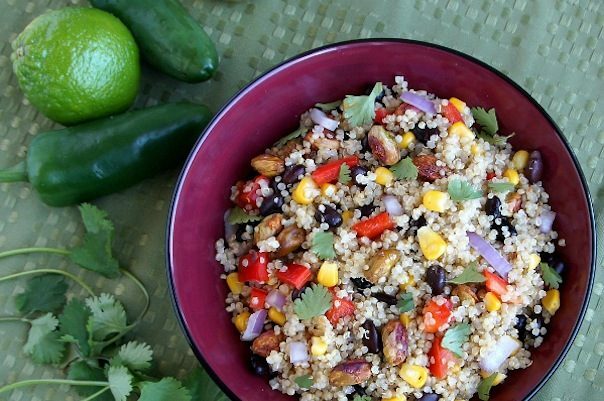 Rev up quinoa's natural protein with black beans and healthy fats from pistachios. Extra veggies add plenty of color and vitamins. The recipe calls for chili-lime pistachios, but you can also zest up regular old nuts by adding extra lime to the chili-lime vinaigrette dressing. Why didn't we think of this first? 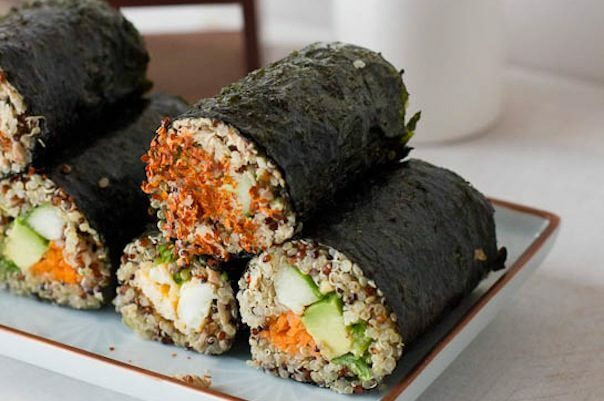 Using quinoa instead of rice packs plenty of protein into vegetarian sushi rolls. Make these bad boys with avocado, cucumber, or use the included recipe for spicy tuna or Sriracha omelet filling. 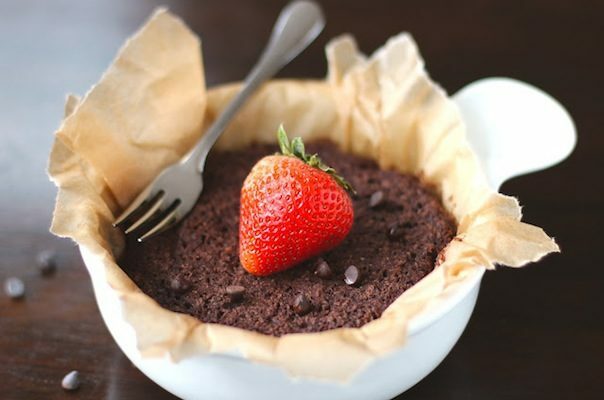 The name of this quick dessert might be a tongue twister, but your mouth will definitely be smiling after the first bite. 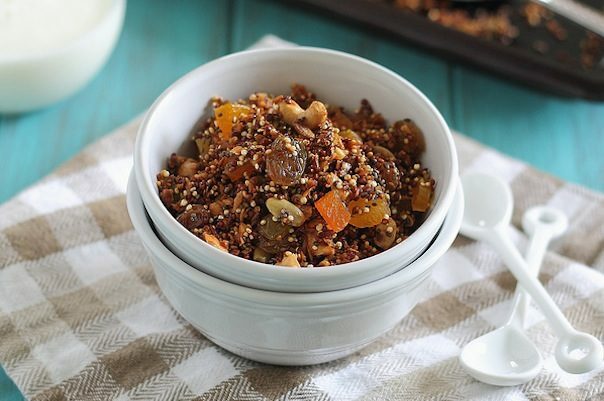 This recipe uses quinoa flakes, which are similar in texture to rolled oats (but gluten-free). The best part? It only takes ten minutes from start to finish. 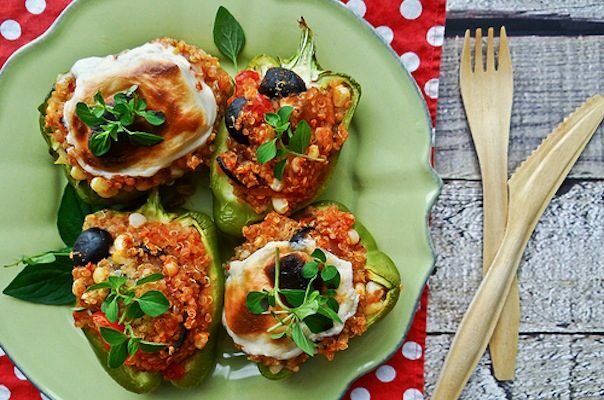 Quick, vegan, gluten-free, and fresh — these stuffed peppers are perfect for pretty much any dinner. Plus, betwen all the corn, tomatoes, and peppers in this recipe, you're definitely getting your veggies. Most quinoa recipes are savory, but this wonder-seed works just as well with sweeter dishes. This healthy granola is loaded with nutty goodness: chia seeds, cashews, coconut, and pumpkin seeds give this version of the breakfast classic plenty of healthy fat and protein.